While clutch replacement is no small job on any car, you should bear in mind that, when the time comes, it’s going to be unavoidable. Your car’s clutch does the vital job of disengaging the engine from its spinning wheels while you change up or down through the gears. It will probably keep working without any sign of problems for several years and many tens of thousands of miles - but being able to recognise the signs of a worn clutch will help make sure that you have this vital job carried out at the right time. To do this, you need to be aware of your clutch’s ‘biting point’, and know what’s going on in the parts affected. If you’ve no idea what any of this means, don’t worry, MyCarNeedsA.com is here to help! When your clutch pedal starts to lose its effectiveness in keeping the car’s engine and the moving wheels apart, you’ll probably notice some nasty grinding and screeching noises which are the sure sign that metal is coming into contact with metal - and not in a good way. Your clutch mechanism is like any other moving part on your car - over time it will wear. For your clutch, this means that you will need to release your foot off the clutch pedal less far before it reaches the biting point. If you can remember that far back, you should recall being told how to find out where this is on the car you were driving on your first driving lesson. You then used that biting point to know when you could safely release the car’s handbrake and start to accelerate away. Having the biting point further up the clutch pedal’s length of travel makes it much easier for the power to be applied smoothly and enable a smooth move off every time. So when the clutch is worn, and the biting point occurs lower down, you may find that it’s more difficult to lift your foot completely off the clutch quickly enough to avoid some over-revving of the engine, and possibly grinding noises too. Your car’s clutch may also display another obvious sign that it’s getting close to needing to be replaced. When you’re accelerating, you might find that the revs suddenly rise by 500 to 1,000rpm more than normal, and produce the unmistakable sound which gives the impression that the car is trying to run away with itself in the shape of a rising engine note. Yet while clutch replacement cost often makes it a job lots of motorists dread, it’s essential for your car’s clutch to operate safely that it is done promptly. You may find that clutch replacement labour cost will vary, because there are four different types of engine/drive configurations in a car: front-wheel drive, rear-wheel drive; and all-wheel drive with either an engine fitted transversely (sideways), or longitudinally (lengthways). Each of these set-ups will require a different timescale for the work to be carried out properly, so will impact on your clutch bearing replacement cost. Getting clutch replacement cost quotes isn’t as straightforward as many other jobs on your car, though. An experienced mechanic will want to explore several different possibilities for the cause of the fault, and may then also have various options to complete an effective repair. This is why you could find wide variations in the quoted costs. Garages also have to consider that clutch replacement is a labour-intensive job, which requires getting into some awkward-to-reach parts of your car, and good access to enable parts to be removed and replaced. The guide in the link here lists the job in a step-by-step way - as you’ll see, there are more than 30 different operations involved. These need to be done in the right order, with nothing missed out, and that’s the real reason why clutch replacement costs are so high. Here at MyCarNeedsA.com, you can then see the full spectrum of repair specialists available, and choose the type you’re happiest with, or simply go with the cheapest quote. Experienced mechanics contributing to a forum on MoneySavingExpert.com also warn that, in order to reach the clutch mechanism and replace it on many cars, a part of the front sub-frame (part of the car’s insides to which all the other parts are bolted) has to be removed for the mechanic to reach it. There really are so many variables in the process of clutch replacement on cars that it’s impossible to go into detail on them all in a single article. Chances are that during the job, even the most experienced mechanic will want to have access to a detailed reference manual for your car to guide them through some stages of the operation. So don’t be surprised if the clutch replacement labour costs seem so high. In fact, you should be reassured, because it will mean that the mechanic knows it isn’t a job which can be rushed, and they will carry it out with the respect and care it needs. Thankfully it’s one bill that doesn’t come around too often. 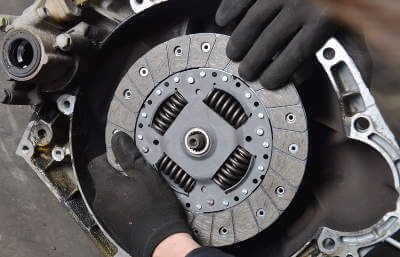 If you can hear or feel worrying signs that clutch replacement might be needed imminently on your vehicle, don’t hang about in starting to shop for clutch bearing replacement cost quotes. You can save time and bother in getting an idea of clutch replacement labor cost levels by posting a request on MyCarNeedsA.com, explaining exactly what you’re looking for. Garages will then contact you with their estimates, and you can pick the one which fits your requirements.